7,500 ft )above sea level, oldest settlement of Hunza, has full of inherited cultural Mosques, with a pool in the middle of the village along with Two Watch Towers. The KKH makes a sweeping S-bend down past Ganish village to the bridge across the Hunza River. There are so many assumptions for the meanings of this name. People assume that the meaning of the Ganish, is derived from the Hindu god Ganesh, some assume as Tribe way, some say as Gold, which is more appropriate. Ganish "King Makers of Hunza valley"
Ganish is situated in central Hunza, 90 km and 2½ hours traveling time from Gilgit. 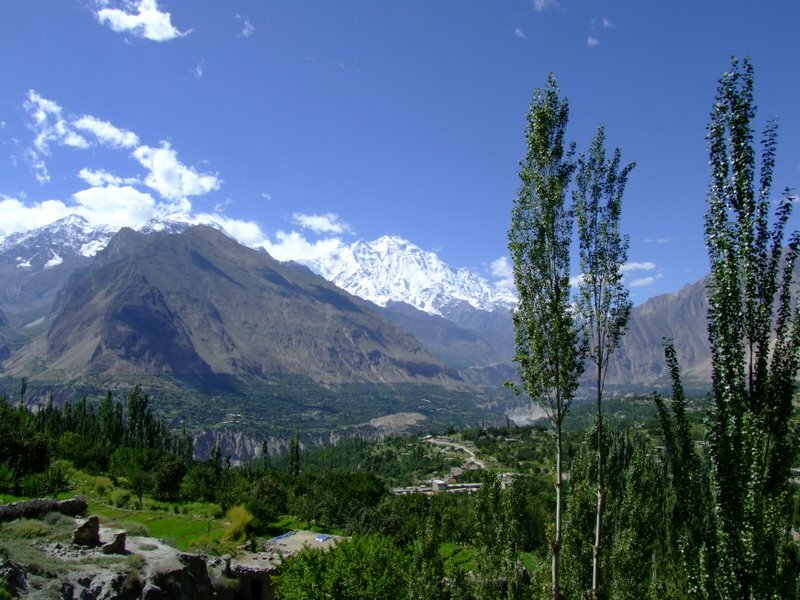 It is located on flat land near the Hunza River and the Hunza hill at an altitude of 7,500 ft, and lies directly below Karimabad, the principal town of the Hunza valley. Spreading over the mountain, opposite the world famous Rakaposhi Peak in Nagar across the Hunza river from Hunza, Karimabad is renowned for the Altit and Baltit Forts, built by the rulers of this former princely state. Ganish is the oldest and first settlement on the ancient Silk Road in Hunza, and is the site of various ancient watch towers, traditional mosques, religious centers,and a reservoir. 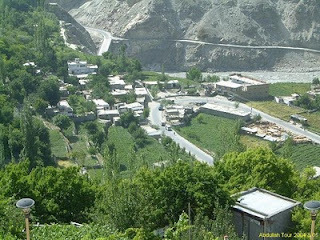 Some people call this village the land of warriors and king makers because people of this village had been involved in battles with Nagar and in decision making during the royal era of Hunza. A feature of the village is the "S" shaped road which cuts through the centre of the village. Ancient sacred rocks are also located near the village. 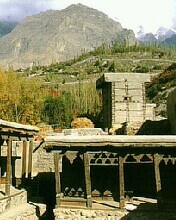 A cluster of old traditional houses make this village unique from other parts of Hunza, That is why village has won a Unesco award for its cultural heritage. Although Hunza has several new Khuns (clusters), Banisatin Khun, Suni Khun, Buldus, Ganish Shukonoshal, Chaboikushal and Tsill Ganish, Ganish Khun is the oldest. The original layout of Ganish Village Khun is mostly intact, even after damage caused by a flood in 1960 and the construction of the Karakorum Highway through it in the 1970s. Ganish Village’s existing historic fabric is a typical central Hunza Khun layout, which comprises 39 houses dating back to the 15th century. This fabric contains a number of buildings (Matam Srah/Imam-bargah, Himaltar and Shikaris Sawab-Ha, mosques, schools, guest house etc) and open spaces that are outstanding in their spatial layout, architecture and decoration. Ancient chinars, mulberry and willow trees testify to the age of the settlement. The village’s surroundings consist of thousand-year-old meticulously constructed terrace houses, lush green agricultural terraces, orchards and meadows. The orchards and meadows terrace down to the Hunza River and create a most beautiful form of landscape heritage. Few years ago there were 14 ancient watch towers built to defend the village from attack, but now only three of them are standing in good condition. People of Ganish used to be famous for their raids against Nagar. 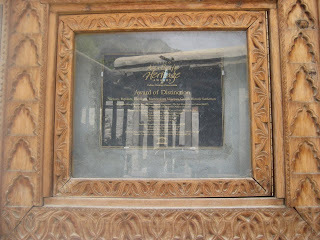 In the 19th century this was Hunza’s main stronghold against Ismailism, and today it’s an integrated Shiite community. It’s Hunza-Nagar’s oldest settlement with an ancient village centre bursting with rejuvenated classic Hunza architecture. From the agricultural terraces surrounding the village can be seen breathtaking views of Karimabad, the Baltit fort, the Altit settlement and its fort as well as the famous Rakaposhi, Ultar, Golden Peak, and Diran mountains. A small but the oldest settelment is blessed with talented children, men and women. A small School Uswa Public School which was funded by one of a Shia welfare trust know as Jabir Bin Hayyan Trust started educating children in modern way, and now this school is one of the well known schools of Hunza providing Doctors, Engineers and lot of Social Workers. IQRA a small asscociation is based in this village gathering funds from working men and women within the town and help desrving students and poor families, the association was found in 1998 by Muhammad Hussain (late). Now this Association has more than 100 members including women. The newly graduates and current students of Ganish Village made an Association GSA Ganish Students Association in 2008. This was the first time that Students from this small town organized ever first seminar for students in Ganish. It was a positive and an appreciatable step towards the development of education. Town Management Society TMS in Ganish, Hunza is funded by Japan, motivating people in different means. Iqra Foundation runs a hostel in karachi where about twelve outstanding students of different universities and colleges are staying.the hostel has a nice library and furnished rooms for students on affordable expenses. Admission into the hostel is based on merit. the town. It is said to be the oldest house in the village, and is typical of the residences of the Hunza nobility, with a winter house comprising storage spaces and a living space on the ground floor and a summer house with veranda above. The carved wooden detailing of the columns, capitals, and door frames is outstanding. With the densely packed fabric of the town, destabilization of the mud and stone structure had begun to threaten neighboring dwellings. The house is now used for meetings of the Ganish Society and for exhibitions. The Ali Gohar House, a 400-year-old architectural masterpiece, formerly used by Hunza’s envoy to Kashgar, is announced as one of the winners to receive the Award for Distinction in Unesco Asia Pacific Award 2009. Ali Gohar House, was selected from 52 international entries by a panel of international conservation experts in architecture, urban planning, heritage conservation and landscape design. The award for 2009, received entries from 14 countries in the region including Australia, China, India, Korea, Vietnam, New Zealand and Thailand. Being involved in the rehabilitation of Ganish settlements since 1998, the Aga Khan Cultural Service, Pakistan, on the request of the Ganish Khun Heritage Care and Social Welfare Society, initiated the physical conservation of the house in 2004. ‘Re-usability’ being the core component for restoration, the Ali Gohar House was intended to be used as a community center, providing working space to the Ganish society, encouraging women to congregate and work, and to be a center for arts, crafts and documentation of Ganish culture. This was planned in consultation with the community and the house has now been leased by the owner to the community. During the restoration, it is ensured minimizing the appearance and unseen presence of all modern elements. The insertions needed for the adaptive re-use were designed in such a way, that it permits, if necessary, their removal or alteration in future without damaging the adjacent original fabric. Minor modern materials such as the addition of basic electric and plumbing services were part of the new material incorporated in the historic building’s fabric. All such insertion were undertaken to retain authenticity and integrity of the original house. During the whole process, three missing historic wooden stairs were replaced by new ones to meet modern safety standards, whereas rest of the house remains in its original form. Till date, the Unesco Asia-Pacific Heritage Award has received 311 entries from 23 territories, spanning a wide range of conservation projects from private residences to palace complexes. Many of the entries have set technical and social benchmarks for conservation in the region, while acting as catalysts for local preservation activity. The award distribution ceremony is expected to take place in the first quarter of 2010 at Ganish, Hunza, and will be attended by the representatives of Unesco, Ministry of Culture and Tourism, community and foreign embassies. The village of Ganish in Hunza valley is enriched with its inheritedcultural buildings, moreover the place is also called the origin of Hunza Valley.Ganish has being famous for its unique history as warriors, defenders, patriotsand kingmakers, but with the passage of time the industrious people Ganish havestarted developing themselves towards modern education and new approaches, thoughthey did meet the standards but these committed people never quit. The current Attabad disaster greatly affected thousands ofpeople in Hunza, locals became IDPs in their own properties, many of them havelost their loved ones, Ganihkutz ( people of Ganish ) have been generously helpedas usual with their traditional hospitality and philanthropic behavior, whetherit was about strike for the rights of affectees , or serving food to hungrypeople, they never stepped back. Imamia Complex in Ganish is newly built for multi purpose,the objective of Imamia Complex is provide medical assistance to everyone,provide advance education to new generation, facilitate women of the area with domesticindustry, but nevertheless to perform religious activities, like Prayers,Matham ( mourning ), this was also kept in mind when the building was underconstruction that people may get shelter in unforeseen hazards. Fortunately orunfortunately the building was used for IDPs of Jan 04. Pakistan NAVY has set their free medical camp in ImamiaComplex, the commandos of Pak Navy have started giving training to locals forsuch incidents, or how can they reduce the risk. The Imamia Complex is no doubta big asset not only for Ganishkutz but this is a proven utility for wholeHunza, the building still need furnishes, due to lack of funds it could not bedone, but we always hope that kind people wont stop their hands to donate forthis holly cause. The local notables have already expresses their views thatImamia Complex and Ganishkutz will always be upfront in this hour of need foreveryone who is affected by Jan 04, and artificial lake. Everyone is welcome touse the complex as shelter or medical assistance.